Whilst I’m not strictly a Marlborough Sauvignon Blanc fan, I figure that the job of a good wine critic is to set aside any prejudices and just judge the wines on quality. Thankfully I’m not a good wine critic 🙂 but I don’t feel like I’m taking one for the team with this trio, as I believe that Marlborough Sauvignon Blanc does have merit, with the better wines (such as these three) entirely deserving of the attention. The real question perhaps is what does make for a ‘better’ Marlborough Sauvignon Blanc? A matter of personal preference perhaps but I’d argue that the best wines show freshness and intensity, with a nose that is not afraid to be herbal/gooseberry laden and a palate that doesn’t rely on residual sugar to fill in the holes. 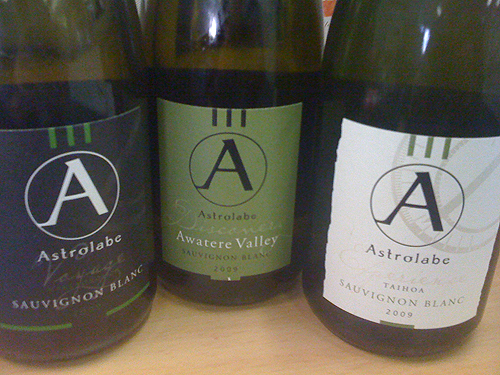 These Astrolabe Sauvs give that ideal a fair shake, making for wines that I feel entirely comfortable recommending.. The entry level wine in the range and built to be approachable. Whilst we are on the topic of personal preferences, the one thing I can’t stand is ageing herbaceous Sauvignon Blanc. That tinned asparagus and green pea character that many (cheaper) Marlborough Sauvs get after circa 12 months+ bottle time is my idea of wine hell (am I alone on this?). But the Astrolabe Voyage doesn’t show any of that. It smells like it has just been squeezed into the bottle – fragrant, fresh and screaming ‘love me, I’m from Marlborough’. Getting into specifics, it’s a fragrant and direct nose, showing bright passionfruit and faintly herbal/white flower aromatics. The palate is perhaps a bit broad and rounded for my tastes, sitting in the generous n’ juicy end of the spectrum and falling away a smidgen toward the tail. Sourced from a vineyard at Kekerunga, this was hand picked, whole bunch pressed and wild yeast fermented in old oak. Now this is my bag. Interestingly, I couldn’t help but think of the complex Lis Neris whites when tasting this, with both sharing that lovely, layered ‘oow I just tasted something else’ palate. I could imagine draining a bottle of the Taihoa with some sort of grilled salmon quite easily…. Lovely cream and herbs nose. Dill, chives and cream even, which made me think of smoked salmon blinis (without the fish). Regardless, it’s very attractive. The palate doesn’t dissapoint either, with levels and layers of sour, lemon (preserved lemons even) flavoured herbs and a beautiful, mandarin flavoured acid tang through the middle. The tang clicks through the finish and lingers beautifully too, cleaning up everything nicely. In the spirit of the Michael Jackson special that my wife insists on watching right now… "You're not alone" with the aged Sauvignon hatred. Andy – agreed, ll the Savvy bases covered with this lot.